thethreeauctioneers has no other items for sale. JUMBO #124 G #133 G and #149 G- Sheena Jungle Queen! 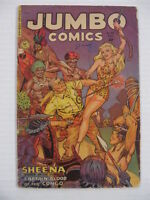 3-D SHEENA JUNGLE QUEEN VG/4.0 - Rare 3-D one off from 1953!